Thanks, Aislynn, over at Knit – Purl – Stitch for this award! 2. I have very thick hair that is going grey. I do not color my hair. I don’t like the idea of putting chemicals all over my head, I don’t like the idea of spending money over and over again – at what point do you stop? My hair is part of who I am. 3. I’m stealing this from Aislynn – I clean when I am upset. It helps me to do physical things. 5. I love to bike, but don’t think for a minute my body reflects it! 6. I smile at people when I pass them. 7. I have always like to organize things. 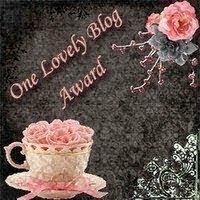 c) Pass the award along to 10 bloggers who you have discovered and who you think are fantastic. Thanks to Heather at Implausible Yarn for this award! Grab the award. Post it on your blog with the name of the person who has granted the award and his or her blog link. Pay it forward to 15 other bloggers that you have newly discovered. Contact those blog owners and let them know they’ve been chosen. Hey, thank you so much for appreciating my blog! I’m a huge fan of yours too, it will be difficult to not include you in the list! I wish I could clean when I’m upset… Or maybe I just wish I cleaned more in general! Oh, and another comment, about the grey hair. My mother, who is 52, has dyed her hair for as long as I can remember, and I’ve always been thinking what you’re thinking: For how long can she keep it up?! At what point do you just stop and stop caring? I doubt I’ll dye my hair when I get grey hair (I’m only 30 and haven’t gotten that far yet), but on the other hand I’ve never had any problems whatsoever of getting older. I think I’ll just embrace the grey-hairedness as a part of myself, and be happy with it! Thank you for the awards! It’s always interesting to read more personal details about blogger friends. We are close to the same age and I feel the same way about my hair. Hmmmm, maybe I should start cleaning when I am upset. That’s better than my usual way of handling it– eating! Hi Jane, Thank you for the awards! I love reading the lists of random things and little details about the people who’s blogs I enjoy so much and read regularly. I just now noticed this – thanks for tagging me! I love getting to know all the crafty bloggers better.